Implantation may be noninvasive (central) or invasive (interstitial or eccentric), depending on whether or not Tr invades through uterine LE into the stroma. Implantation in domestic animals differs from that of rodents and primates where the conceptus enters a receptive uterus and almost immediately attaches to uterine LE. Domestic animals have a prolonged preimplantation period (the prereceptive phase) in which the developing conceptus migrates throughout the uterine lumen (Fig. 1A). Equine embryos remain spherical and contained within a capsule prior to attachment, whereas pig and ruminant concep-tuses shed the zona pellucida (hatching) and transform morphologically from a spherical to a filamentous structure. Preattachment conceptus development is accompanied by differentiation of the Tr layer that secretes the pregnancy recognition signal. Fig. 1 Development of preimplantation conceptus (A), is followed by either noninvasive (B) or invasive (C) implantation and then either noninvasive or invasive type of placenta (D). sterically prevent this interaction. The functional changes in uterine LE include a decrease in the apical glycocalyx, cytoskeletal remodeling of LE, and loss of polarity. The initial stages depicted in Fig. 1 compare conceptus/ maternal interactions in domestic animals (noninvasive implantation, Fig. 1B) with those of rodents, carnivores, and primates (invasive implantation, Fig. 1C). Differences in the extent of trophoblast (gives rise to chorion) interaction with maternal tissues among species are illustrated in Fig. 1D, which depicts the interface between maternal and fetal cells, giving rise to placental structures. For example, intimate contact between chorion derived from Tr and an intact LE is maintained in pigs throughout pregnancy (epitheliochorial placenta, Fig. 1D, left panel). Because the chorion is continuously in contact with uterine LE, this is referred to as a diffuse placenta. Ruminant conceptuses form binucleate Tr cells, which invade and fuse with uterine LE to form multinucleated cells or a syncytium (synepitheliochorial placenta, Fig. 1D, middle panel). Binucleate Tr cells and the syncytium derived from binucleate cell migration are the source of placental lactogen. 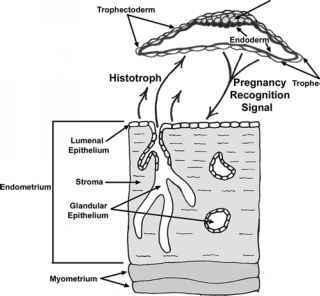 In both epitheliochorial and synepi-theliochorial placentation, the conceptus remains within the uterine lumen throughout gestation. In contrast to the diffuse porcine placenta, attachment of chorioallantois in ruminants occurs at discrete sites along the uterine wall called caruncles that are oval elevations of endometrial mucosa devoid of uterine glands. Contact between chorioallantois and caruncles leads to development of highly convoluted placental villous structures termed cotyledons. The resultant structure, consisting of maternal caruncles and placental cotyledons, is the placentome. Carnivores, rodents, and primates exhibit invasive implanation where the blastocyst invades and implants deeply into the endometrial stoma and the uterine LE is restored over the site of implantation. During initial contact, the trophoblast layer is highly proliferative and undergoes syncytial formation to form a syncytiotropho-blast cell layer that develops stable adhesion with uterine LE followed by penetration of syncyiotrophoblasts into the uterine wall to establish extensive contacts with maternal vasculature. Loss of maternal vascular endothe-lial cells results in the formation of maternal blood sinusoids in the hemochorial placentae of higher primates and rodents (Fig. 1D, right panel), whereas the hemoen-dothelial placentae of carnivores (not shown) retain the endothelial layer. Mononuclear cytotrophoblasts underlie syncytiotrophoblasts, and these cells migrate out of the trophoblast layer.